We all know that frugality is about saving money. Sometimes it’s also about simplicity. I’ve been to Hawaii a few times and once had the pleasure of seeing kalua pork in the making. Two very large Hawaiians spent a couple of hours building a fire, digging an imu and then preparing and burying a pig. It was an amazing site that few outsiders get a chance to witness. The care that went into the process was amazing. I got tired just watching all the painstaking labor that went into making this one dish! 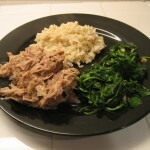 Soon after this trip to Hawaii, I decided to make kalua pork at home. I read many recipes, many of which involved some process nearly as complicated as the traditional method. I did try one of these recipes which involved slicing the outer inch of a pork shoulder all over before rubbing with liquid smoke and Hawaiian sea salt and then wrapping in cabbage leaves and foil before baking for many hours. The results were incredibly good but still way too much work. 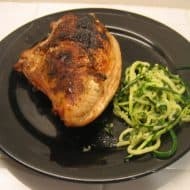 I continued to make this recipe and try my own variations over the years and have currently landed on something ridiculously simple that still tastes amazingly good. 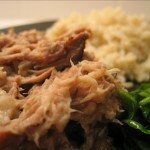 Put the pork shoulder into a crock pot whole- don’t cut it up. Set on low for 10 hours or high for 6 hours until falling off the bone. Remove the bones and separate the meat from the liquid. Shred the meat with two forks. Skim the fat off the juices and set the remaining liquid aside. Add the liquid smoke and 1/2 the salt to the meat and start adding the reserved liquid back in while stirring the meat. Keep adding liquid until the meat won’t absorb any more. If you get all the liquid back in, add some water. Add more salt and liquid smoke to taste. The final dish will be salty, but you’re going to eat this with rice. This dish is a perfect example of the use of Hawaii’s main seasoning- salt. You could use Hawaiian pink or black sea salt, but I usually just use kosher salt. The liquid smoke replaces the smokiness normally provided by the smoldering wood and ti leaves in the imu. I’ve used hickory liquid smoke in a pinch but the flavor isn’t nearly as good as with the mesquite. I recently served this with some brown rice and sauted spinach. To really serve this island-style, put a big pile of kalua pork on a plate and with an ice cream scoop, serve two scoops of rice and one scoop of macaroni salad. Mahalo, brau! Sounds delicious. May have to try it as one of my weekend cooking dishes or put it on in the morning when I leave for work and let it cook all day.